Baseball is one of the most popular sports in the U.S. People are fond of this sport and the game is a national passion. These machines have advanced to the point where they can throw not only fastballs but also curveballs, sliders and screwballs. The arm action machine is similar to a pitcher who feeds the ball by his hand; this machine simulates the delivery of a pitcher and carries the ball at the end of the bracket, much like a hand. It delivers the ball in an overhand motion. The circular machine contains a wheel similar to the tire of a motorcycle. The circular wheel machine shoots the ball to the batter once the ball is fed to its wheels. These machines help baseball players to get batting practice on their own. Pitching machines are set up in batting cage or nets that will collect the balls once they are hit. Regular Practice: If you are a professional baseball player and want to improve your game, pitching machine helps you immensely in improving your batting technique. It improves your game by getting the right ‘arm swing’ and hitting power. Hand eye co-ordination: Foreseeing the direction of the incoming pitched ball will improve the hand eye co-ordination, you can also check your stance and head placement while the ball is being delivered. The speed of the machine is usually around 60 kms per hour and has a great perfection for each throw. Affordability: These batting aids are getting very popular due to their availability at affordable prices. There are different types of machines available in the market varying in their price, size and features. They can be purchased from sports shops or online. The most recommended way of purchase would be through online, as it offers lot of varieties and discounts. Velocity: Pitching machines offer a speed of 20 to 104 mph, this allows the batter to practice at varied speeds. This velocity comes from a powerful motor that propels the spinning wheels or throwing arm. The adjustment knobs help in adjusting the speeds quickly. An optimum utilization and regular practice of the pitching machine helps in taking the success from the ‘batting cage’ to the ‘batting box’. Pitching machines help in achieving this objective. Many baseball and softball players recommend using a pitching machine for practicing the game but using batting cages is also important, which helps them save time required for searching the ball. It is important to have both batting cages and pitching machines, as baseball and softball players can use them for practicing at home and field. Using batting cages is a good way to keep the ball safe from getting lost and retrieve it easily. However, the best things about batting cages and pitching machines are that they give flexibility of practicing the game at a time and place of their choice. Moreover, one does not have to visit several stores to buy these equipment, as they are easily available online. Having batting cages can be fun for baseball and softball players especially if they are working professionals. This is because, they can practice on Saturday afternoons, when they do not have enough work or are bored of watching the T.V. Moreover, with batting cages and pitching machines, they can practice the game with their family and have a great time together. However, not following the safety precautions can be risky and lead to unnecessary problems. Therefore, it is advisable to keep in mind the important aspects to practice with comfort and convenience. It is important for baseball and softball players to keep in mind the safety rules when using batting cages and pitching machines. There are baseball pitching machines that throw balls at 75 miles per hour and not preparing themselves in advance can cause serious damage. In case of batting cages, baseball and softball players need to follow certain safety precautions to avoid injuries. Whether small kids or adults, following the safety guidelines can keep them safe and protected from getting hurt. Small children have the greatest danger for being injured by batting cages. Moreover, pitching machines used inside the batting cages do not consider the child's size and ability therefore, parents should take extra precaution when encouraging their child to practice using batting cages. Many children get hurt for not using the batting cages properly and parents should educate them about their right usage. It is advisable to use batting cages when practicing baseball using pitching machines but not following the safety standards can cause serious injuries to arms, legs, and face. For example, a child should wear a helmet when practicing with batting cages. The probability of getting hurt when using batting cages is not limited to children but also to adults. Many adults suffer from injuries while practicing baseball therefore, it not right for the adults to consider themselves big enough to not follow safety precautions. Moreover, the pitching machines for adults are set for higher speeds, thus increasing the risk of injury as well. In addition, adults should not try to climb on the batting cages, as it can damage the batting cage besides injuring themselves. Individuals should take precautionary measures when passing by batting cages and should avoid standing in close proximity to the batting cages. Moreover, children should not be allowed to play around the area and that the participants should wear protective clothing and gear to avoid accidents. Batting practices are not only about getting the timing down to a single speed. It is important that you learn about the pitch before getting the timing down. Jugs pitching machines can help you throw at different pitches at varying velocities and become a pro in almost no time. Practice is the only way you can win with the pitchers. There are many machines that allows very little for pitch or speed type adjustments. You can develop your natural swings with those machines, but there are many limitations that you need to cope with as well. So, if you do not want any negative influence on your gaming skills, you must rely on Jugs pitching machines. You can hit one type of pitch and thereafter move to the next with a Jugs pitching machine. This is a good way to prepare yourself and get ready to face whatever comes across you. • You can alter location, pitch types and velocity. • Most of the athletes recommend Jugs pitching machines. Albert Pujols became one of the most famous names all over the world because of the cuts he took for several years. He has been doing it for several years. So, this implies that you need a pitching machine when you want to develop the highest level of skills. Pitching machines, which are not capable of handling extensive routine cannot do any good for you. Jugs Sports is highly recommended by all sports personalities. So, if so many pros agree to the benefits of using Jugs pitching machines, it is certainly beneficial. It is better to be on the safe side by going for pitching machines recommended by experts of highest level. Jugs Super Softball Pitching Machine is particularly useful for experts. This machine can be set up easily and carried anywhere without any hitches. It is advisable that players beyond 13 years of age buy this machine. 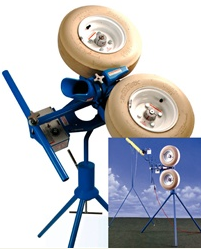 Beginners and the experts can use jugs Combo Baseball Softball Pitching Machine. This pitching machine is used to throw softballs, baseballs and tennis balls. It is a good way to acquire skills for playing tennis, softball or baseball with these machines. 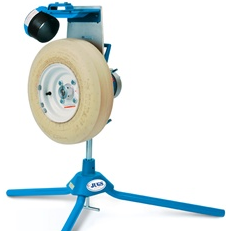 Jugs Curveball Fastball Pitching Machine is one of the most popular among the huge line of jugs machines. It is a good way to get trained with this machine and learn about the pitches and various types of curves. You won't have to worry about carrying or setting-up these machines. As you can see, there are plenty of benefits of going for Jugs pitching machines whether you are a pro or a beginner. You can improve your hitting skills with such wonder machines. So, all you need to do is browse online for a suitable website and buy the suitable pitching machine. Tennis is one of the most talked about game these days. The game of tennis has evolved from the stage when people waited in local parks to play to the stage where you had a machine and no longer had to wait for turns. This is called the tennis ball machines. While purchasing tennis ball machines you should look for the battery life. You can look for the rechargeable batteries or standard electricity batteries. A built in battery can perform for 5 hours when charged over the night. Inspect the oscillation capacity of tennis ball machines. Game of tennis depends on the cadence and beat of the ball. So, you need to see if the ball is oscillating and covering the entire court. Your tennis ball machine must assist you with practice of different shots, backhands, lobs and forehand. Ask about the heaviest speed of tennis ball machine that will help you practice some of the best shots. It is very important that you analyze the aspects of direction, speed, and evaluate the height up to which the ball can go. Tennis ball machines that you choose must be easy to travel with. You must consider the factor of portability when it comes to choosing tennis ball machines. Easy handles and wheels are some of the features you must look for to ensure that the machine is easily transportable. Look for tennis ball machines that can be easily transported through rough surfaces, grass like surfaces and stairs. Warranty period is another feature you need to look for while purchasing tennis ball machines. You should be very careful about this. Good tennis ball machines come with two years warranty. You should not consider anything ideally below than that while buying tennis ball machines. These are some of the vital aspects that you are supposed to keep in mind to ensure you get the best of what is expected out of it. Quality of a tennis ball machine can be identified by the top spin. You can get winner shots with top spin. Winner strike can be differentiated with a good grip over backspin and top spins. If you are planning to buy tennis ball machines, you can look online for the extensive range of products. You can choose the free home delivery option and practice with the good quality tennis ball machines to improve your overall skills. So, if you are planning to acquire the perfection and turn into a pro, this is indeed a very good option that you can look for. Gone are those days when you had to wait for turns or ask others to help you during the practice sessions. You can now practice to your heart's content and whenever you feel like with good tennis ball machines.